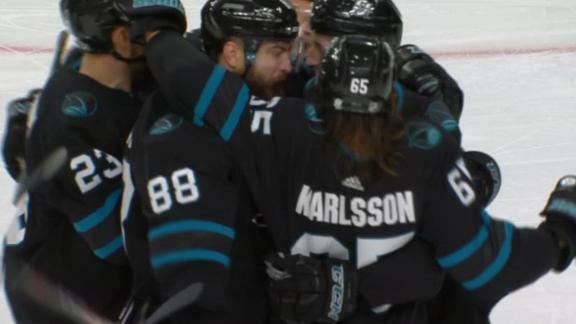 LAS VEGAS -- The San Jose Sharks rallied late to give their dads a memorable night just off the Las Vegas strip. The Sharks trailed after one period for just the ninth time this season. ... Valentin Zykov made his Golden Knights debut after being claimed off waivers from Edmonton on Dec. 29. ... Burns played in his 435th consecutive game, a streak that began Nov. 21, 2013. ... San Jose's Erik Karlsson saw his 14-game streak with at least one assist come to an end. ... San Jose had its five-game streak with at least one power-play goal snapped. ... The Golden Knights dropped to 11-3-2 when leading after one period. Joonas Donskoi, Tomas Hertl and Melker Karlsson all score in the third as the Sharks top the Knights' 3-2.